Whether you’re making a first impression on a prospective client or entertaining a client you’ve had for years, your business will benefit with the corporate limousine service of Platinum Ride Limo. Their luxury vehicles and private chauffeurs will help you close deals and strengthen partnerships in comfort, class and style. From Phoenix airport transfer for clients visiting from out of town, to Scottsdale hummer limousine service for hosting a corporate party, this Phoenix-based limo service is available all over the Valley. For a client flying in from out of town, you want his travel plans to be as easy as possible. The last thing you want is him waiting around at the airport for a ride, or him renting a car himself and trying to navigate the roads in a foreign town. His head needs to be in the same place yours does – on the purpose of your meeting, not the logistics of getting there. That’s something you can arrange for him beforehand with reliable, on-time Phoenix airport transportation that’s like your client’s own personal taxi limousine shuttle. The chauffeur will bring the client to you or pick you up first so you can greet your client at the airport for an extra touch that’s both personal and professional. Of course, corporate limo service for visiting clients need not be limited to Phoenix airport transfer. Pamper your client throughout his visit for ultimate impact. That means scheduling your client’s taxi limo shuttle for trips to and from his hotel, your office, restaurants and anywhere else your client might need to go. You can join him as often as you like, ideally taking the time to entertain your client with all the must-see sights in the Valley, from the Superstition Mountains to historic Heritage Square downtown. Just think of all the progress you can make with your client – personally and professionally –tooling around town with ease while having fun. And it’s not just out-of-town clients you can impress with Platinum Ride Limo. 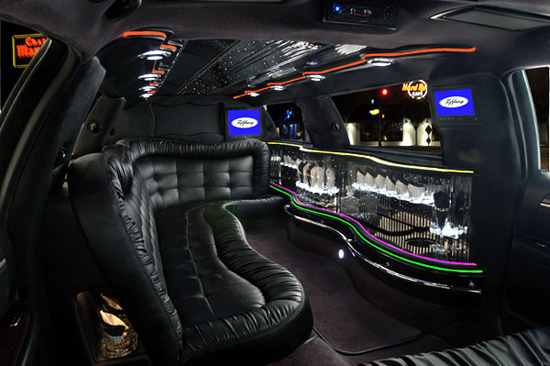 Host a party for your local clients with corporate limo service. Your clients are free to relax and have fun knowing their own private chauffeur is designated to drive. Whether you host the event in one venue, or it’s scattered across the Valley’s hottest night spots, there’s a stretch limo for you – from the Limobus, to the Scottsdale Hummer Limo, to the Chrysler 300M with Lamborghini angel-wing doors. Owned and operated by Italian brothers Joey and Frank DeVento, Platinum Ride Limo was founded on their vision of “sheer excellence,” which is why every limo in their fleet is top of the line. Equally important to them though is making the luxury limo experience possible for everyone. That’s why their rates are surprisingly affordable considering what you get in return – clients impressed by your obvious success and how special you’ve made them feel.